Burgeoning Melbourne buzz band The Smith Street Band released their second album Sunshine And Technology to joyous reviews in August 2012, following it up right away with a celebratory tour, and sold out headline shows in capital cities Australia-wide. They’ve continued to make this year monumental by completing lengthy, successful, self-booked maiden tours throughout the US and China, playing a million shows and making uncountable new friends along the way. They also just snared spots on the Big Day Out and prime #4 position in triple j's Short.Fast.Loud's hugely popular Best of 2012 poll. This is one happy band. 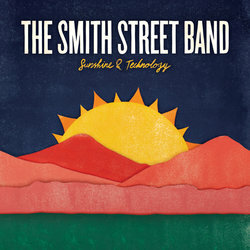 Sunshine And Technology’s lyrical and musical progressions suggest The Smith Street Band is incapable of standing still, and perhaps, of growing up. Both endearing qualities in inspired punk rock upstarts. Vocalist Wil Wagner has a natural penchant for words, allowing Sunshine & Technology to seamlessly shifts between the personal and political. The future is indeed radiant for The Smith Street Band as they take their music to unexplored destinations. Young Drunk is a song about a funeral, yet it has all the dynamic, upbeat fist-pumping qualities that all thrilling tunes by The Smith Street Band band have. Showcasing the stand-out lyrical deftness of frontman Wil Wagner, it's easy to see how Young Drunk has quickly become a live favourite. Royal Chant - Did You Pay Cash For That Panic Attack?